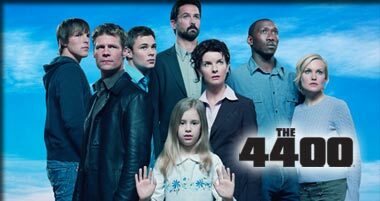 The 4400 (pronounced "The Forty-Four Hundred") began as a Miniseries created for the USA Network. The Miniseries aired as six episodes in the summer of 2004, and the show was brought back as a series with a 13-episode season in the summer of 2005, followed by a third 12-episode season in 2006 and a fourth, 13-episode season in 2007. After that, between the writers strike and the very evident signs of The Chris Carter Effect, the series was not picked up for a new season. The basic premise is that four thousand, four hundred people from the past century have been abducted, then Touched by Vorlons, and returned to the present day. They have not aged and they do not remember their abductions. Many of the returnees discover that they have new abilities, such as telekinesis, mind control, clairvoyance, or unnatural control of phlebotinum. Anti-Hero: Jordan Collier was one of the rarest types imaginable: An Affably Evil type IV. The Wrath of Graham illustrates this incredibly well. A sort half-and-half one: Danny Farrell eventually gained the ability to spread Promicin to anyone who came in contact with him, thereby giving them abilities, which could be seen as awesome. However, due to the nature of promicin, there was a fifty percent chance that he would kill the person instead. Also Isabelle, who goes back and forth a couple times before being forced to learn that Redemption Equals Death. I Just Want to Be Special: Danny Farrell, Shawn's younger brother. After his older brother gets healing powers, he gets jealous. Eventually, in later seasons, he's one of the first main characters to take the superpower-granting drug that has a 50% fatality rate. He's given the power to spread the drug to others like a contagion, which may kill them, and he can't control it. Be Careful What You Wish For. Shawn has to reverse his healing powers and Mercy Kill him after Danny accidentally kills their mother and several other people and can't stop it. So there's that. Also, Graham Holt. Jordan did not take this well. Superhuman Transfusion: Isabel's blood can restore other returnee's abilities from the inhibitor. Year Inside, Hour Outside - Alana's dream-land power works this way. A God Am I - Besides Isabelle, a boy in the first chapter of fourth season goes all the way with this. It doesn't help that he gains the ability of making other people think he is a God. Cuckoo Nest - Which actually introduced a new Love Interest. Dating Catwoman - After Tom Baldwin is Marked, Megan discovers she has been literally "sleeping with the enemy". Epiphanic Prison - Crossed over with Ontological Mystery in one episode. A person has the power to create these for conflicting people so they can learn how to work together. Bad Future - Pretty much any glimpse of the future thanks to precognition and Time Travel, in both the short and long term. Black and Gray Morality - Even the best-intentioned groups are often Well Intentioned Extremists, and those that aren't are not often very effective. Doubly so with the different factions amongst the abductors, who both have to let horrible things come to pass for their preferred futures, though the evil faction definitely wants the worse outcome. Brother Chuck - Dennis Ryland and Nina Jarvis both dissapear after the third season. As does Diana's boyfriend Ben in the middle of the fourth. Dang. Barely averted with Richard Tyler, who inexplicably vanishes for a while after the third season, but makes a last minute two-episode reappearance near the end of the series. His lengthy absence still isn't very comprehensively explained, though. California Doubling: Filmed in Canada. Cliff Hanger - Which the now-canceled series ended on. Omniscient Morality License - The abductors were clearly psychics in regards to how the powers they gave out would be used, but it went to ridiculous levels with a serial killer who they made far more effective, so a relative of one of his victims would start killing random innocent members of the 4400 for revenge, which was used to invoke public sympathy for the group. No telling which one's worse: The Xanatos Roulette or the disregard for innocent lives. Not to mention that they also sent back a woman whose power was the ability to wipe out an entire town overnight. But then, Utopia Justifies the Means, right? Well it's either that, or a horrible future for humanity where billions of people have died. Also, the "Typhoid Mary" thing was suggested to be The Government's fault - their Promicin Inhibitor fucked up a lot of people's powers before it started killing them. Shout-Out: The finale scene of the final episodes has Where is my mind from the Pixies playing. The episode involved half of Seattle dying due to the Promicin virus and the survivors declaring their independence from the rest of the US. Not in terms of content but in terms of theme, it resembles the ending of Fight Club. Utopia Justifies the Means: Jordan Collier's plans to establish a new world order of people with abilities. And, considering their methods, the abductors of the 4400. Particularly harsh when it comes to the abductors: the best outcome of their machinations involves half the human population dying at some point so every survivor can have superpowers, just so that remaining half of humanity can survive and create a less horrible future. The worst (and default) outcome is everyone but a very small group of well-off and privileged humans dying and the world becoming an ecological nightmare. ...and whose initials are J.C. This page was last edited on 23 February 2016, at 12:22.